Once you have manually picked a mute line (see Manually Picking a Mute) or created an angle mute (see Creating an Angle Mute), you can export the mute. In the Control Panel, open the Mute tab. 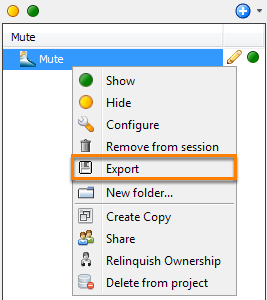 In the tree, right-click the mute you want to export and click Export. You can export 2D and 3D mutes. Type the file name to be created. By default, the system will open the 110mutes subfolder in the project directory to save the .mute file.